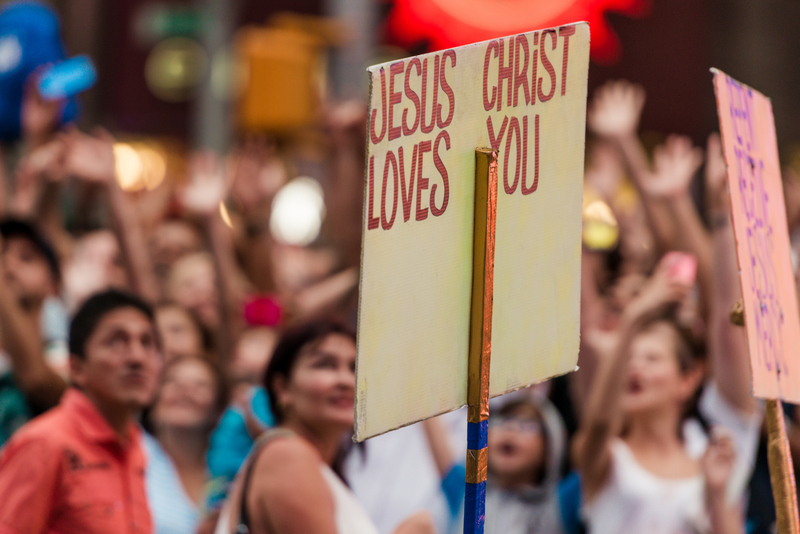 Street preachers hold up signs in Times Square, New York City, on July 8, 2015 (iStock). When the essayist Meghan O’Gieblyn was a student at the Moody Bible Institute in Chicago, a Friday night out meant sidewalk evangelism. She and her friends would draw the plan of salvation on a portable chalkboard, hand out tracts and invite passersby to get saved. O’Gieblyn got few takers. Eventually, she left the school and lost her faith. Much of O’Gieblyn’s collection Interior States analyzes the evangelical conviction and Midwestern earnestness that led her to the street corners. She suggests that these two unassuming yet politically powerful elements of American culture distill our national psychic complexes. In her eyes, the dubious virtue of niceness, “so ubiquitous that it seems practically constitutional” in the Midwest, is a veneer that covers Americans’ “sheer indifference” to neighbors and strangers alike. The essays reflect an older understanding of “nice” as synonymous with “subtle but precise.” Beneath O’Gieblyn’s approachable style lies a sharp instrument for incising our culture. She avoids the twin temptations of thoughtful nonfiction today: the imprecision often justified by the “messiness” of lived experience and the oblique abstraction justified by a need for literary “difficulty.” As she writes in an essay on subtlety, a writer’s relationship to her readers is necessarily a matter of faith. O’Gieblyn has an acute sense for irony, pointing out the fact that the pastoral life reenacted in Henry Ford’s nostalgic frontier theme park Deerfield Village was destroyed by the very industrialization he created. Or that evangelicals like Mike Pence claim to be exiles in a secular Babylon yet turn away actual exiles from Syria and Iraq. But the most prominent Christians don’t really seem ashamed of the things that put them at odds with secular life, or at least, with certain aspects of mainstream culture. They hype their opposition to Hollywood, news media and the Democratic Party without ceasing. At the same time, many embrace militarism, and a few punctuate Sunday services with fireworks. Christians are (necessarily) selective in their embrace of culture; the question is whether their selection criteria align with the Gospel. Christians are (necessarily) selective in their embrace of culture; the question is whether their selection criteria align with the Gospel. In O’Gieblyn’s vision of authentic Christianity, the church would attract people through its countercultural life together. The collection’s opening essay, “Dispatch from Flyover Country,” describes a mass baptism at the eastern shore of Lake Michigan. Hundreds stand barefoot on the beach as pastors dunk each new believer one by one. “Whenever someone emerged from the water,” O’Gieblyn writes, “everyone on the beach cheered and clapped as the congregant waded back through the mist like a ghost, their clothes suddenly thin and weighed down with water.” O’Gieblyn, by this time an unbeliever, watches from the dunes until a drone with a camera—likely belonging to a church, so it can document the event for its YouTube channel—zooms by and breaks the spell. O’Gieblyn refers frequently to losing the faith that anchored her and inspired her family to stockpile provisions for the anticipated year 2000 apocalypse. She intermittently mourns the loss of her place in evangelical culture; she confesses to listening to fire-and-brimstone radio preachers on long solitary drives and to playing her old DC Talk albums in the privacy of her home. This article also appeared in print, under the headline "Precision Instruments," in the February 4, 2019 issue.